The 2013-2014 Winter will go down in the books for many areas of North American as one with record cold and snowfall. While the calendar shows the return of Spring this week, many areas of the country will still experience additional snowfall accumulations. The combination of cold temperatures and above average snowfall has led to minimal melting throughout the season. As a result, placement of the snow has created many challenges for snow removal contractors. A common theme heard among contractors is: “we are running out of places to put the snow!" If snow can be removed from a lot or hard surface and appropriate room exists, always push the snow as far back as possible beyond the curb or lot edge to make room for additional snow. If snow cannot be removed from a lot or hard surface, always place snow piles on a predetermined spot approved by the client and marked on the snow contractor’s preseason site report. Do not pile snow in a handicap parking space. Do not bury or plow snow onto a fire hydrant, post indicator valve, or fire hookup along the building wall. Avoid placement of snow piles where thaw/melt off can run across the parking lot surface. Try to place piles near drain grates to avoid icy situations during thaw-and-refreeze periods. Do not push snow against a building. Do not block building doorways or emergency exits. 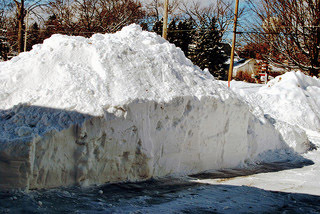 Do not block pedestrian walks or paths with snow piles. Do not push snow onto motor vehicles. Do not plow snow in front of or bury trash containers. Sidewalk labor must shovel inside trash container enclosure for access to the doors. If the container is not in an enclosure, create a clear path to the access doors or panels. In addition to the ASCA/ANSI standards, if you are dealing with space issues as a result of the record snowfall this season, the removal and relocation of the snow from the site may need to be considered. How are you dealing with snow placement this winter? What best practices have you established for your snow removal teams?